About Miguel V. Message Miguel V.
Miguel is a fantastic guide. He is very dedicated to his clients. He really wants to give an optimal experience and he does succeed at that. VERY knowledgeable. Take a notebook with you. I would give him ten stars of I had the option. Lisbon was our second tour with Miguel. He led an informative, fun, and well-paced tour of a beautiful and friendly city. Miguel calls you "my friend" and treats you as a friend. He listened to our requests and helped us to see and experience as much of Lisbon and the surrounding sites as possible. Miguel clearly loves Portugal, her heritage and wants to share her beauty with visitors. Thank you Miguel! If we are able to visit Portugal another time, we will be in touch. Miguel - "our friend" Thank you for making our visit to Sintra and her palaces and Cabo de Roca very special. We learned much and appreciated your recommendations and thoughtful planning of our time in your beautiful city. We loved that you truly cared that we see all that we had hoped to see and more. My daughter and I send best wishes for a great summer. Miguel was a good friend by the time we were 50% into our trip. He understood our preferences and limitations. He is organized in his work, career and life expectancies. A lovely person who has a lot to offer in any of his life choices, including, obviously being a superior guide. Miguel is a true professional, super friendly, highly competent and genuinely accommodating and patient. He enriched our knowledge with his vast and profound knowledge of the region and made it super fun for our entire family. I highly recommend his services and would definitely rehire him. Thank you Miguel. A very happy birthday day-tour by a kind, generous, empathetic and knowledgeable Miguel! Highly committed to his clients, fluent in English and an excellent and patient driver even in Lisbon traffic jams. He designed the Sintra trip to fit our physical limitations and found us a delicious lunch. We shall use his skills when we come to Lisbon again. TOUR GUIDE RESPONSE: Michael, thank you very much for provide me the pleasure of making a tour for your wife birthday. Hope she is happy with my present ;). My kind regards, Miguel V.
Miguel arrived before meet up time. It was a long, but comfortable ride from Lisbon to Fátima. He was descriptive of the sites that we passed. He even mentioned significant history along the way. He is very professional but friendly at the same time. Despite not feeling well, he pushed through finishing the trip, ensuring that I arrived safe at my destination. I was planning to book another trip with him but his calendar is already booked for the time I will be in Lisbon. That's how good of a guide he is! TOUR GUIDE RESPONSE: Franz to me you become a friend and also that's why I do this job, because of amazing people like you. Thank you very much for everything. My super kind regards, Miguel V.
We had a really great tour of Obidos and Mafra with Miguel. He was very informative and added a great deal to our enjoyment and understanding of these sites. We especially appreciated his willingness to substitute for another guide at almost the last minute. He made sure to find a place for us to enjoy a typical Portuguese lunch - very good. Also, Miguel is a really nice, personable guy to spend the day with. TOUR GUIDE RESPONSE: Thank you very much Tim and Wendy. It was a great day also for me, the lunch we will not forget :). And thank you for being such very nice persons. Kind regards, Miguel V.
We just finished our tour with Migel and we could not have had a better guide! Our ages range from. 59-80 with all kinds of mobility issues. Migel was patient and considerate of our needs and last minute itinerary changes. We had a great time and enjoyed every minute of our tour. His English and knowledge of the area made our tour perfect! TOUR GUIDE RESPONSE: Hello Linda I must tell you are a wonderful lady and the all group. It was so amazing and satisfying to lunch and walk in Sintra with you guys. Hope the tiles are fine and please send me a picture of them. Wish you my best wishes and my kind regards. Big kiss, Miguel V.
We had an excellent tour with Miguel! He was very flexible and customized the tour at our request -- we wanted to visit Obidos first to not shortchange our time in that medieval city (and it did not disappoint -- walk the entire wall if you can). We had a lovely and very authentic lunch in Nazare and a peaceful visit of Fatima. Miguel was very attentive and provided plenty of historical and cultural insights throughout our time together. We highly recommend Miguel!! TOUR GUIDE RESPONSE: Hello Marshall, how are you and you wife? Thank for your feedback it is very important for me. Hope you and your family are good and I also had a fantastic day with you, and the lunch it was so good :). I wish you the best from the heart. Also, please make me a comment, you are helping me. My very best regards and wishes, Miguel V.
We had a great day in Sintra and on the Portugal coast with Miguel. Miguel was friendly and well organized. Very timely. We could tell he cared deeply about his guests' experience. The Pena Castle was unique but VERY crowded. I would recommend skipping the inside tour and just tour the gardens and lakes. Otherwise, too much time is spent in line. Lunch was delicious with fresh fish! Thank you Miguel for a wonderful day. Your country is so very nice and so are you! TOUR GUIDE RESPONSE: Hi Madeleine it was my pleasure and hope you have a very nice continuation of hollidays. My kind regards, Miguel V.
We enjoyed touring with Miguel very much. He is very warm and personable. He was knowledgeable of the places we visited, and did his best to engage us with history and stories. He was patient and accomodating. He adjusted his tour for us after we had an hour and a half airport delay. Miguel was also willing to adjust his tour as possible to accommodate our interests . He was extremely helpful and assisted my mom who has difficulty walking. Miguel is a good and safe driver. Great sense of humour! TOUR GUIDE RESPONSE: Hello hello Kathleen thank you very mush for you comment. I had a great time to in both days it was very fan and enjoyable, your parents and you are amazing persons and your mother is a really cool lady I just love her attitude in life, is a person full of love. I wish you the best in life and my kind regards. Miguel V.
Miguel showed up on time and was an engaging and informative guide. The four of us enjoyed our outing with him, including where he chose for us to have our lunch. Not finding the Sintra city center as interesting as others might, we have suggested that future customers use that slot for city center or alternatively a walk along the park to see the art. Miguel gets bonus points for being responsive in the pre-planning phase of the arrangements and for doing a darn good job of driving the narrow roads. TOUR GUIDE RESPONSE: Hello Nadeen, thank you very mush for your comment, it is a nice suggestion. Hope you are doing well, the group it was fantastic and fun, i really enjoyed it. The lunch is definitely one of the best parts of this tour :). Wish you the best. My kind regards, Miguel V.
Miguel is all the things a tour guide should be - courteous, knowledgeable, friendly, animated, flexible, interesting and interested! We thoroughly enjoyed our 5 hours with him. He has a solid future in the business, and would book with him again in a future tour should the opportunity arise. All the best to you Miguel! TOUR GUIDE RESPONSE: Hi Greg, thank you very much for taking some time to make this comment. I loved the day it was super enjoyable and calm and watt can I say I just did my best for you to enjoy your time in Portugal. Hope you are doing well. My best wishes, Miguel V.
We could have easily given Miguel more than 5 stars if only allowed. There is a big difference between "sharing" from simply "showing" the different attractions, and Miguel was phenomenal in guiding us around and really giving us the true feel of the local flavors. We greatly appreciate his sincerity, the camaraderie, for being a great companion while we savor some of the best Portuguese sceneries. We strongly recommend Miguel as your tour guide if you want to have the best experience while in Portugal! TOUR GUIDE RESPONSE: Hi my dear friend Gladell, I just have no words to describe such a nice review. I did my best to give the best experience, you helped because you are easy persons and I enjoyed so much. Is this the kind of experience that I search in this job. My super kind regards, Miguel V.
Miguel V. was an excellent guide for our tour of the Sintra region. He was punctual, polite, friendly and extremely knowledgeable regarding the history, features and nuances of the area. He was an excellent driver, and the car used for our tour was clean and well maintained. I would strongly recommend him for tours in this area. TOUR GUIDE RESPONSE: Thank you, Steven, it was also a really big pleasure to meet both of guys, of course I had a wonderful journey to. Next time you come to visit my country I will have all the pleasure in help you, now you have a friend in Portugal ;). My kind regards, Miguel V.
TOUR GUIDE RESPONSE: Thank you very much Sandra, It was a great pleasure to met you and all your family and friends. It was a wonderful day. Thank you for your good energy and good will. Kind regards. Your professionalism speaks volumes. Keep up with the good work and your knowledge is impeccable. We still miss you! The fish lunch was amazing. Thank you for taking us there. TOUR GUIDE RESPONSE: Thank you, with your help I wroth one more part of the volume! It was an amazing experience, my first bus tour and I will never forget that. Wish you all good things and health. You will be in my hearth forever. My best and kind regards to Moez and Shy and the hole amazing group ;). Miguel, you were a rock star! Everyone in the group loved you and still misses you. Bravo for a job well done with a bus full of senior citizens. TOUR GUIDE RESPONSE: Moez and Shy, Thank you very much again. I was really nice and also a pleasure have you in my land and have the opportunity to show it. The good energy and the all group it was amazing and I also miss them. Kind regards. Miguel is very knowledgeable about the national history of the areas we visited as well the local cultural details. His suggested plan for visiting the Pena Palace was excellent and it gave us enough time to see everything we wanted to see. He has a very good heart and has a genuine and sincere interest in his visitors. He was even able to help us with some technical issues at the beginning of the tour. TOUR GUIDE RESPONSE: Thank you very much Lance, It was a great pleasure to met you and your wife. I had a wonderful day. Wish you the best and a good life together. Kind regards. We requested Miguel's services for a bus full of 45 seniors. He was excessively patient, courteous, kind, loving, easy to get along with, professional and very accommodating. I am in the travel industry and would request Miguel's assistance again without any hesitation. Bravo Miguel! TOUR GUIDE RESPONSE: Whaooo Moez and Shy, Thank you very much for your trust. I had a wonderful day with all of you full of fun and happiness. Thank you for your good energy and good will. Kind regards. Miguel hizo muy buen trabajo dandonos indicaciones precisas e informaciones utiles en el camino para prepararnos a lo que ibamos a ver en los diferentes lugares del tour. Siempre fue muy amigable y estuvo atento a nuestras preguntas, ademas siempre mostro interes genuino en transmitirnos ese "toque / perspectiva local" que apreciamos mucho y que es precisamente lo que da un valor adicional a la experiencia de hacer un tour con alguien que conoce realmente los lugares, Miguel gracias por ser nuestro guía! TOUR GUIDE RESPONSE: Hola rodrigo para mí fue un gran placer poder mostrar mi país por dos días y en lugares tan especiales. Ustedes también son personas extremadamente genuinas y sé que nuestro abrazo final fue cierto. Muchas gracias amigos. Voy a recordar te aquí en Portugal;). Miguel was great, informative, and always prompt to give insightful comments. We really enjoyed the whole tour as on our way to the sites he explained several issues of what we were about to see which helped to understand the experiences better: Fatima -- amazing uplifting peaceful place, Nazare -- fantastic views from the hill, genuine Nazarenos [locals selling homemade high quality textile & food products], Obidos -- small forted city full of history and misticism... Miguel made it all easy to enjoy! TOUR GUIDE RESPONSE: Thank you very mush for your comment Rodrigo, it was easy since the beginning with you and your mother you are amazing cute persons. See you on Monday. Cheers amigos. Very good tour, however people in the back of car could not hear. Also, make sure you have local currency. Miguel is very nice and accommodating. Miguel was friendly, enthusiastic, accommodating and knowledgeable. He made the trip fun for my husband, myself, our adult granddaughter and her two friends/traveling companions. 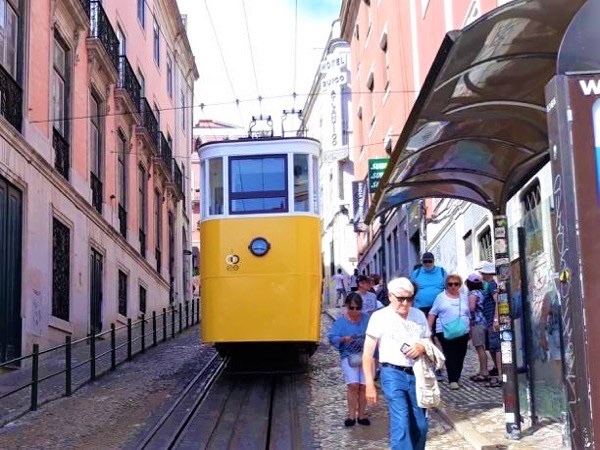 We enjoyed the flexibility of having our own private tour, and Miguel went out of his way to ensure that we saw as much as possible of the beautiful sights in Sintra, Cabo da Roca, the "Mouth of Hell" and Cascais before returning us to Lisbon. TOUR GUIDE RESPONSE: Hi Leslie, it is so nice to see your comment :). I must say that I ha d a beautiful day very nice and enjoyable, you are people that I not forget for shore. Hope you are fine. Thanks also for the complement about my, very very well spoke English haha, it was a fantastic moment. My friends wish you the best, Kind regards. We did a shore excursion to Fatima and Obidois with Miguel. There were four in our group. He was a wonderful guide. Very accommodating to our port schedule. He was very informative and patient with us and our endless questions! TOUR GUIDE RESPONSE: It was also a very enjoyable day for me too. Thank you for your take some time to make this comment. My kind regards and wish all the best. TOUR GUIDE RESPONSE: Thank you very much for your feedback Christine, I had a wonderful day also, you are a cute family :). It was a pleasure. Kind regards, Miguel V.